In terms of sculpting Buzzer appears to be a cross between his original version and the updated design seen in the Sigma 6 animated series. Clad in his signature sleeveless tan shirt and jeans, this appears to be the flaxen-haired ‘Nok that fans remember from the 80’s. His belt is painted black and is adorned with two black grenades on the right, an olive pouch on the left, and a silver skull buckle in the center. 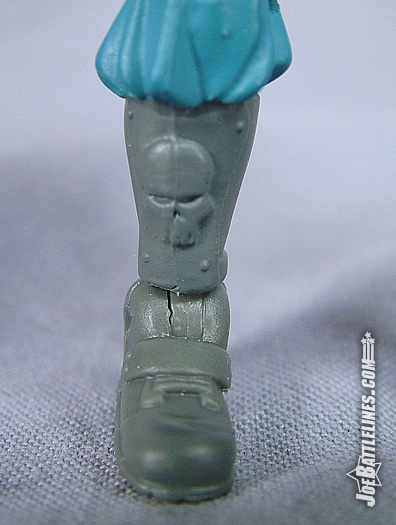 His boots are painted flat gray and feature a sculpted skull on the front side. A brown band covers Buzzer’s left wrist. 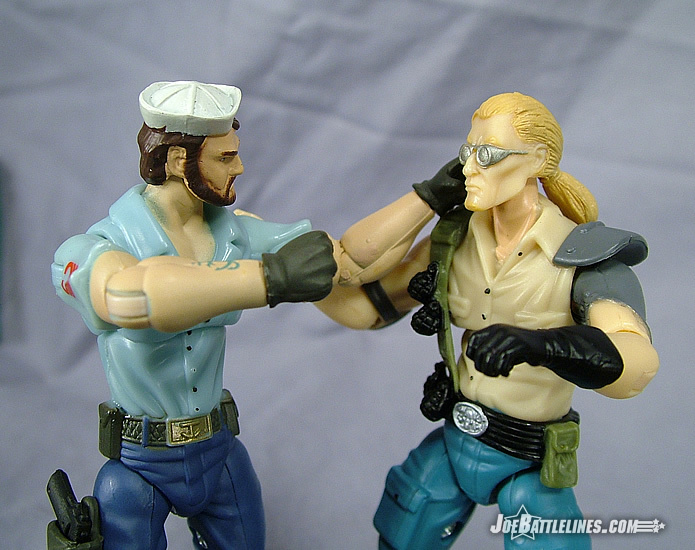 As a young Joe fan, my opinion of the Dreadnoks changed depending on what day of the week you asked me about them. At times, I found them to be terrific henchmen for Zartan and on other days I found them to be a barely-literate group of thugs who should be allowed to leave the confines of their own homes unsupervised. They walked a fine line between functioning as comic relief and mentally-challenged. 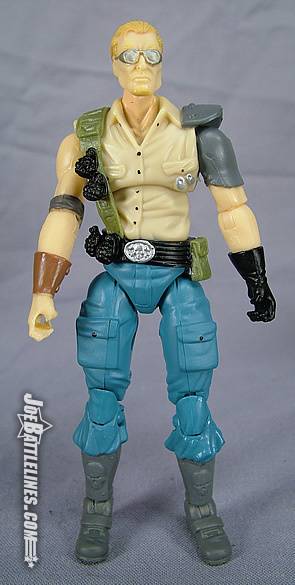 Over the years I found myself more interested in Zartan than I was in his henchmen and eventually the Dreadnoks faded from my memory. In the GvC era of figures, Hasbro released two of the original three in the form of Ripper and Torch. 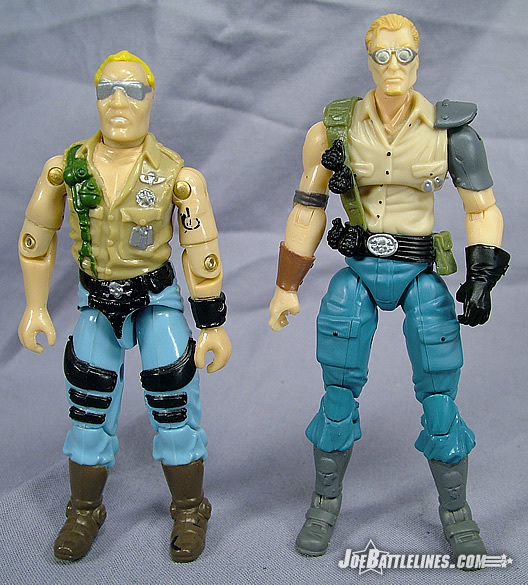 When the 25A line was announced and Buzzer’s name showed up on the list I realized that the Dreadnoks would once again be a part of a GIJoe line and that I’d have to write a review of their figures in the not too distant future. 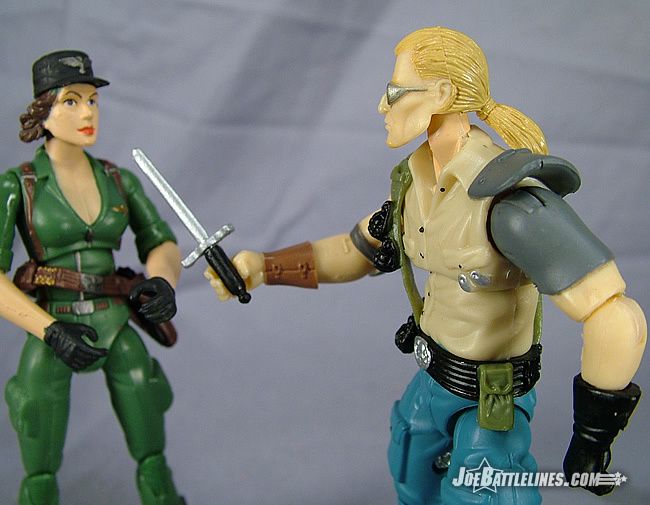 Oddly enough, Buzzer is the figure from wave 2 whose review I’m writing last—and I’m not entirely certain as to why. right forearm while his left hand is protected by a black glove. 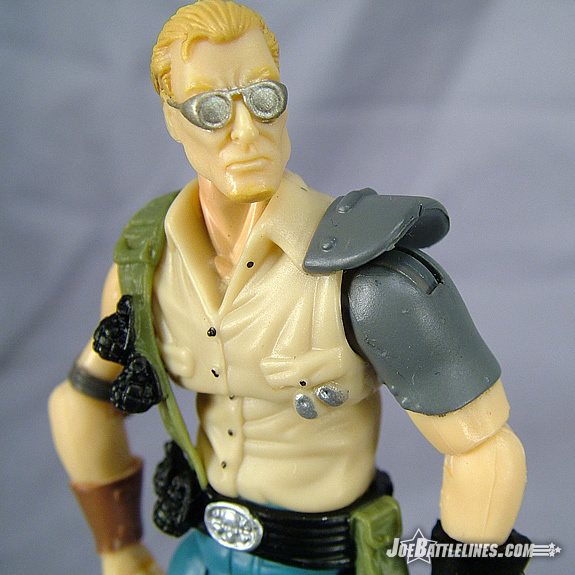 An olive rubber strap slips over the figure’s right shoulder and has two molded grenades attached to it. The biggest change to Buzzer’s character design is found on his left shoulder which is now covered in a shoulder pad and armored piece similar to that found on the original Zandar figure. This last little detail seems inspired by the Sigma 6 animated version and adds a bit of extra color to the character design. 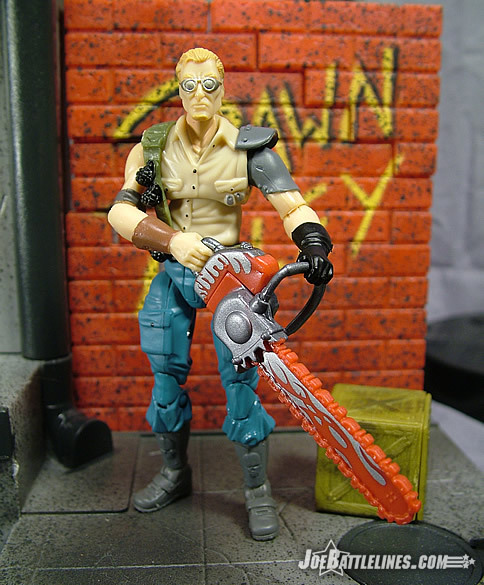 Personally, I’d think that a guy who wields a chainsaw would want a bit more protection on his arms but I guess that’s why he’s the Dreadnok and I’m not. In the end this is a solid rendition of a classic ARAH character with only a few minor changes that I can live with. 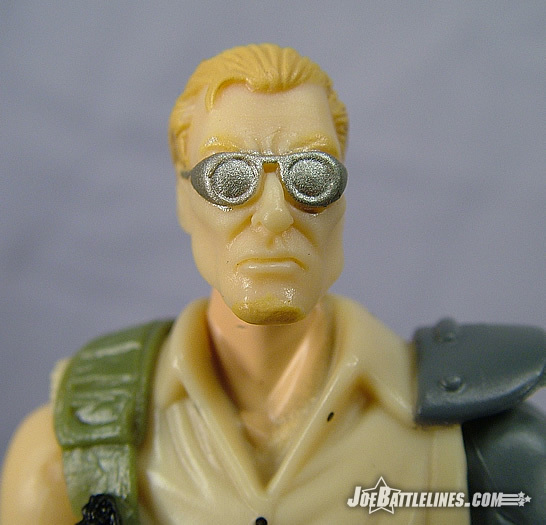 Hasbro did a solid job in recreating Buzzer’s original “giant noggin” with more realistic proportions. His face is almost a bit thin—not in terms of sculpting but in terms of design. Buzzer’s cheekbones are really pronounced while his cheeks are a bit sunken, possibly indicating that this former Cambridge academic has a few vices that are starting to take their toll. His hairline is sculpted high on his forehand with one errant strand on the right side and his signature ponytail extends well below his collared shirt. His eyes are covered by his silver round glasses and his chin is now adorned with a small patch of painted yellow whiskers. The result is the classic “biker beatnik” that fans have come to expect. 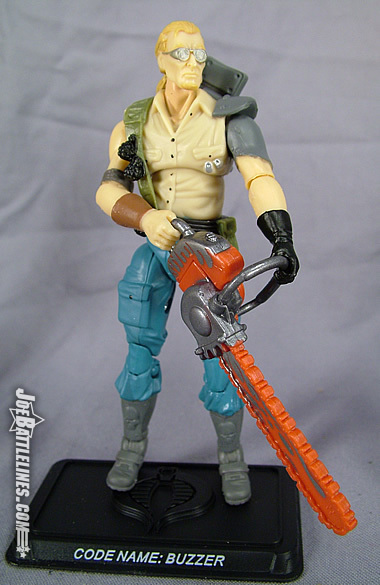 Buzzer is packaged with a gas can back pack and his signatory weapon—a large chainsaw. The intervening years must have given Buzzer a sense of vanity – or he was featured on an episode of “Pimp My Power Tools”. The reason I say this is that the Nok’s chainsaw now features bright red flames painted on the blade guard and on the engine. In some ways, this is fitting his persona as a sociopath biker with some serious destructive tendencies. Regardless, the look fits and now his weapon is “badder than ever”. If Buzzer has any downsides, it is found in his right hand and in the articulation limitations that his pelvic design presents. I’ve already addressed that latter issue in several other reviews and Hasbro has stated that fans will see improved waist articulation in 2008. 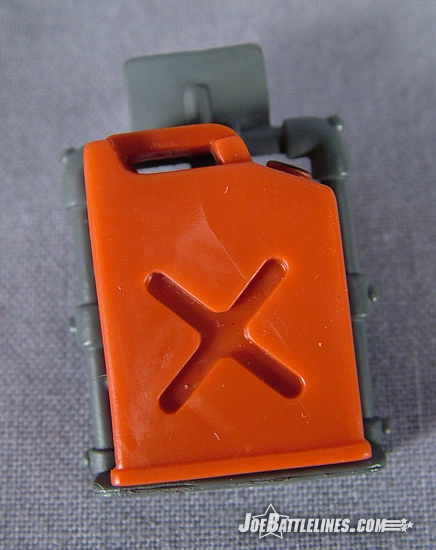 Buzzer’s right hand, however, has an enlarged “C grip” to accommodate the handle of his chainsaw. Normally this wouldn’t be a problem—if the figure was molded from a harder grade of plastic. Unfortunately, most of the 25A line is using a softer grade of plastic in their hands and, as such, Buzzer has a tendency to drop his chainsaw if the pose is too extreme. His fingers are molded just a touch too thin to support the weight of anything heavier than a standard rifle—and his chainsaw has that weight. So, unless he’s holding the “Zombie Killer 6000” in a two-handed grip I don’t see the pony-tailed Nok carrying his tree cutter around much. It’s a shame as this figure would look great sitting on a bike with one hand on the handle bars and the other raising his saw over his head. All-in-all I do like Buzzer. I found it a bit hard to get terribly excited about him in terms of the review but that’s perhaps that he’s just never been a favorite character of mine. 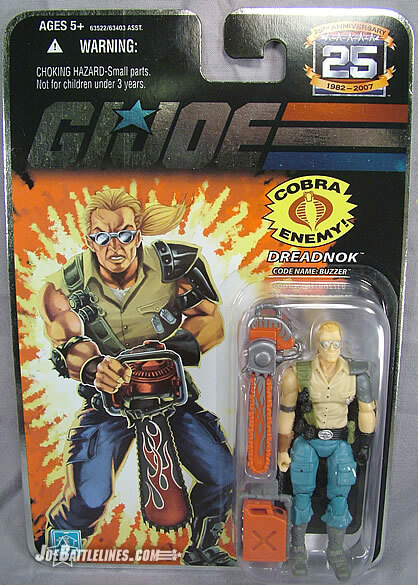 Combine that with the fact that Dreadnoks are a sub-group in which my interest tends to fluctuate and you’ve got a figure that wasn’t a priority for me. 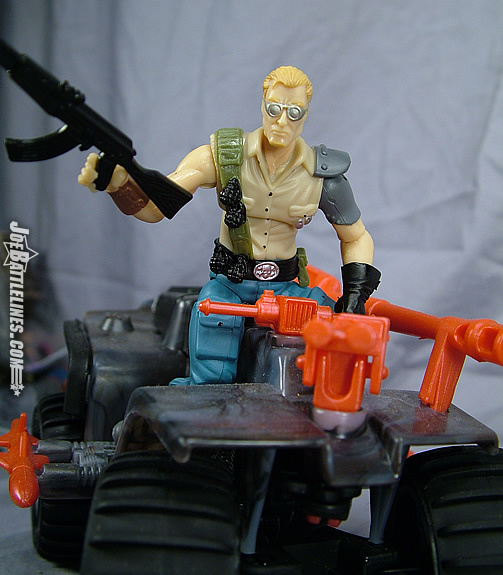 Had he been included in a wave that didn’t feature figures like Lady Jaye, Beach Head, and Serpentor and I might have found him more exciting. 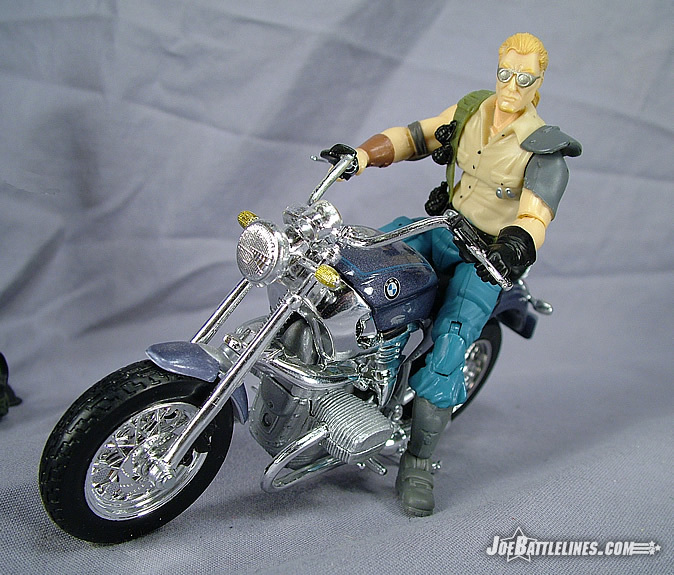 Still, fans of the original Australian biker gang are going to enjoy this figure for the update that he is. Now that the comic pack featuring Torch (my personal favorite) and Ripper has been announced, fans will once again have the chance to own all three of the original Nok’s in the same scale. So, Buzzer’s a good figure—he’s just not my favorite of the bunch.